Is your dog 'barking mad' or is his behavior normal? If your Fido is very vocal it can sometimes be difficult to tell the difference! Anyone who's ever owned a dog will tell you that listening to Fifi barking her little head off for no good reason is enough to drive the most laid-back puppy parent to seriously question their sanity! There are lots of 'triggers' for this behavior, some of them understandable and 'okay', others not so much (to us at least). This page will help you figure out if your pup's noise-making is just part of her being a dog, or whether it's an issue you need to deal with. Problem Behavior or Natural Instinct? Actually, many times it's both but if your puppy is still very young it can be hard to tell the difference. The good news is that if you identify a pattern of excessive barking at this stage you still have the time to prevent, or at least reduce, the amount of chaos your precious puppy will cause before he grows up to be a loud mouth! Just like a lot of doggy behaviors that humans find undesirable, dog barking has it's roots firmly fixed in normal, canine behavior. Dogs bark to communicate with other dogs or their human family, and sometimes just to express themselves or to 'hear the sound of their own voice'. Barking comes naturally to Fido and often serves an important purpose (e. warning of approaching strangers). Barking should only be considered a problem behavior if it becomes excessive or interferes with daily life or your relationship with your pooch. If you believe your puppy barks too much the first step is to try and find out why he's making so much noise. There's a number of possible reasons for excessive barking. If your puppy is spending too much time outside by himself or is home alone for long periods his barking could be just his way of complaining about the situation. When you're a puppy it's no fun if you're by yourself with no-one to talk to or play with for hours at a time, so although this type of barking is a nuisance, it's also a normal (and understandable) behavior! If the dog barking frenzy happens because your little one is on his own for 8 hours every day while his family is at work or school, try to find a way to break up his day. Perhaps a neighbor, relative or friend could come by and take him for a walk, or even a short playtime in the yard. Maybe you, or another family member (you could take turns!) could come home at lunchtime. If this isn't possible you could think about hiring a pet sitter or dog walker, or taking him to a doggy day care/puppy playgroup (even once or twice a week would help). Also make sure that your dog gets tons of attention, exercise and one-on-one loving when you're home. He's been waiting for you all day, so give him what he needs to be happy and secure. Puppies have energy to burn, but it usually comes in short bursts followed by the need for a nice nap. Older dogs generally are more sedentary than puppies, but they still need to use up that energy - both physically and mentally. 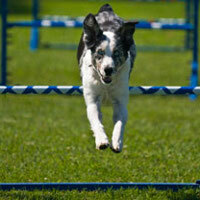 If your dog isn't getting enough playtime or exercise the pent-up energy will make him 'antsy' or fidgety. This could easily lead to a lot of barking in his attempt to 'let off steam'. *Some dog breeds require more exercise than others and you might want to check out my dog breed information page for more information on this. To keep your pup happy and healthy (and tired) build several exercise sessions, play times and training sessions into his daily schedule. For puppies a 5 minute playtime or 'lesson' is enough. Older dogs need longer. .... all of these will work your dog's brain and body and help burn off excess energy - and hopefully reduce the noise level. Joining a formal obedience class, or a dog agility or flyball club (or something similar) is also a great way for both of you to socialize, have fun and get the benefits of exercise at the same time. Is he just looking for attention? Puppies are like little children in that they think the world revolves around them! As your pup can't pull on your sleeve and whine (although he may do his very best canine impersonation of this) he may resort to barking instead. If the barking starts every time you're on the phone, cooking dinner or helping with homework your little one could just be making a play for your attention. As with toddlers or demanding children, the best remedy for this type of behavior is not to reward it! So, don't give your pup the attention he's looking for when he starts vocalizing in this way, don't talk to him... don't even make eye contact. Just go about your business as though he's not there. When he STOPS barking at you, that's the time to show him some love and reward the silence, not the noise! Is his barking a sign of anxiety? Some puppies are above-averagely nervous or jumpy. Certain breeds are more prone to this type of behavior than others, and it can also be a result of poor breeding or a lack of socialization. But all dogs are different and some are just naturally more anxious than others. If your pet gets loud every time he sees a stranger (or the vacuum cleaner), hears a loud noise, or catches sight of an unfamiliar object he may be an especially timid pup who needs a lot of reassurance before he feels comfortable with new people, pets or objects. 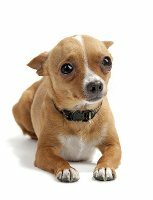 Dog separation anxiety is a more severe form of 'nerves' than generalized anxiety and can cause a pup or dog who's left alone to bark, howl or whine incessantly. He gets so panicky and distraught that he may chew everything he can find, or pee/poop due to his distress, even if he's normally fully potty-trained. A puppy is often a little scared and homesick during his first few days in a new home, and this is normal and usually disappears within a few days, or a week or two. But separation anxiety in puppies can occasionally happen. A calm, orderly environment and a low level of noise or excitability around the home all help a nervous puppy to feel less stressed. A predictable daily routine also helps tremendously. 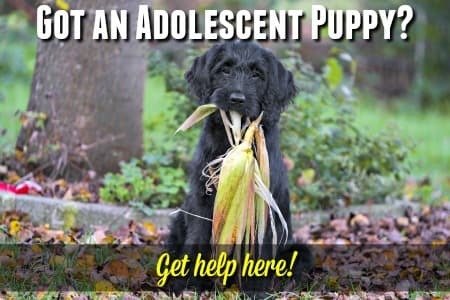 Regular socialization is an important part of your pup's training and a nervous puppy needs to get used to LOTS of different people, sounds, sights and smells but never force the issue. Just give him the opportunity to explore new place and see new faces and let him take it at his own pace. There are a number of different products that can also be used to help keep your pooch calm, I recommend using natural options such as the ones you'll find on my Natural Remedies for Dogs page. You can also buy calming pheremone-based diffusers which can be plugged into any socket and give off an scent YOU won't notice, but your pet will. Other products include food supplements, flower essences and calming treats. You'll find some of these on this page Medications For Dog Separation Anxiety. Is he a bodyguard in the making? Puppies of the dog breeds originally designed as guardians and protectors have very strong protective tendencies. These are hard-wired into their little brains and are generally a purely reflexive action. If the noise in your household is often a result of your pet seeing a stranger at the front door or his attempt to warn another dog that this is his front yard then he is just following his instincts. A puppy with guardian breed heritage will develop this naturally protective instinct without any help from you. 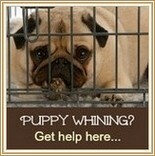 It is never a good idea to encourage this behavior earlier or more forcefully than comes readily to your puppy. 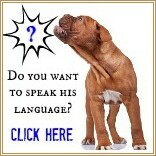 As your little one matures he will learn to be more discerning about who/what he's barking at. If your dog thinks he's your designated body guard you need to be sure to take him to puppy classes and then to obedience school where you can both learn how and when it's appropriate for him to exercise all that macho stuff! Meanwhile discourage barking or growling at strangers or other dogs. Fido needs to know what his boundaries/rules are and what you expect from him. If you don't show him that, he'll make up the 'rules' himself... and these will generally not be the ones you want. * NEVER encourage a dog to be aggressive or defensive, or to bark/growl and 'guard'. He will do this if and when it's truly necessary anyway, and your interference in this area will only cause problems. 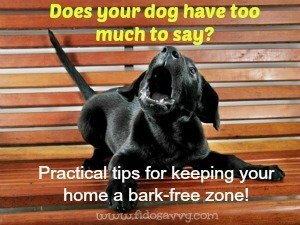 Sometimes your dog's barking can get to be excessive, causing all kinds of problems for you, your neighbors and more. If your dog is particularly stubborn, or just really (REALLY!) seems to like the sound of his own voice, you may need to get a bit of extra help! In these situations, an electronic dog training collar could be just what the doctor ordered. There are several types of dog training collars, some which use a tonal correction (a 'beeping' noise), some which use a mile electrical pulse (a 'zap'), and some which use a citronella spray (lemon scented liquid), as a correction. Many models have both tonal and a fully adjustable range of impulse correction (for use separately or consecutively). You can pick exactly what's right for your situation, and the size and personality of your dog. These types of dog training collar are usually extremely effective and are totally safe (test one on yourself if you're a skeptic!). Find out more about the no bark collar on the Petsafe dog training collars page. A solid, privacy fence around your yard is also a good way to stop your dog from barking at the neighbors, their cars, their cats, passing school-children etc. etc. It's a pricey solution, but one that's worth taking if you can afford it! Dog growling is different from dog barking. A dog shouldn't growl at a human (unless there's a very real threat to them/you/your possessions) and a puppy should never growl at anyone, period. A truly aggressive puppy is very (very) rare, and most growling is simply your pup's way of trying to communicate something to you. 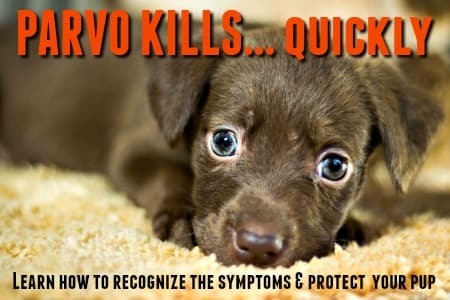 If yourFido has a tendency to growl when he doesn't get his own way, or at any other time really, you need to start discouraging this behavior right now. In an older dog this can become dominant behavior and cause real problems. Be sure to correct your pup every time he growls at you, and never allow your behavior to be influenced by his.